In the process of teaching science, educational interventions are often challenged by students’ misconceptions about various phenomena. Specifically, mechanics is an important field of physical sciences that has been shown to be one of the most difficult to learn for students. The process of science learning has been studied a lot over the past years but there is still no consensus as to what happens to the initial conceptions of students during learning. Are these initial conceptions replaced, reorganized, integrated into a new, broader theory or do they remain present, therefore coexisting with new scientific knowledge? The main objective of this research was to determine whether experts in mechanics still hold misconceptions in their brain, which they have to inhibit in order to answer scientifically. Two groups of participants were compared: a group of novices who have not undergone a conceptual change in learning mechanics and a group of experts who are presumed to have already achieved a conceptual change. An fMRI protocol was used to obtain functional brain images while doing a cognitive task in mechanics. Two types of movies were presented: Newtonian movies (in accordance with Newton's laws of motion) and naive movies (not in accordance). Participants were asked to judge whether the movies were scientifically correct or incorrect. The results show that experts activate, significantly more than novices, areas associated with inhibition (dorsolateral and ventrolateral prefrontal cortex) when they evaluate naïve stimuli, thus suggesting that mechanics expertise would be linked to the ability to inhibit its misconceptions. To read the poster, click here. Brault Foisy, L.-M., Masson, S., Potvin, P., & Riopel, M. (2012, May 24-26). 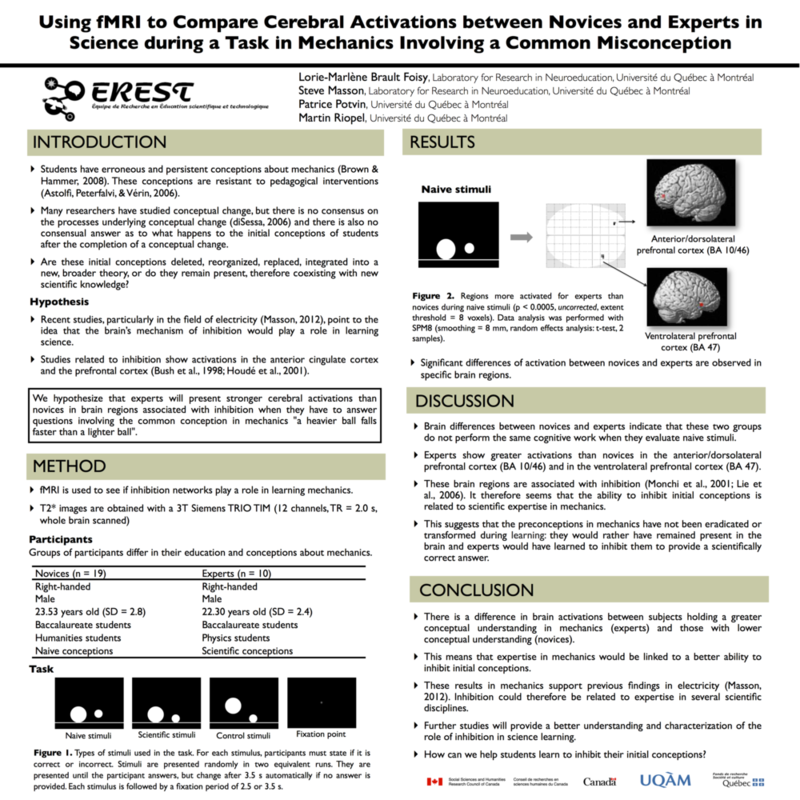 Using fMRI to compare cerebral activations between novices and experts in science during a task in mechanics involving a common misconception. 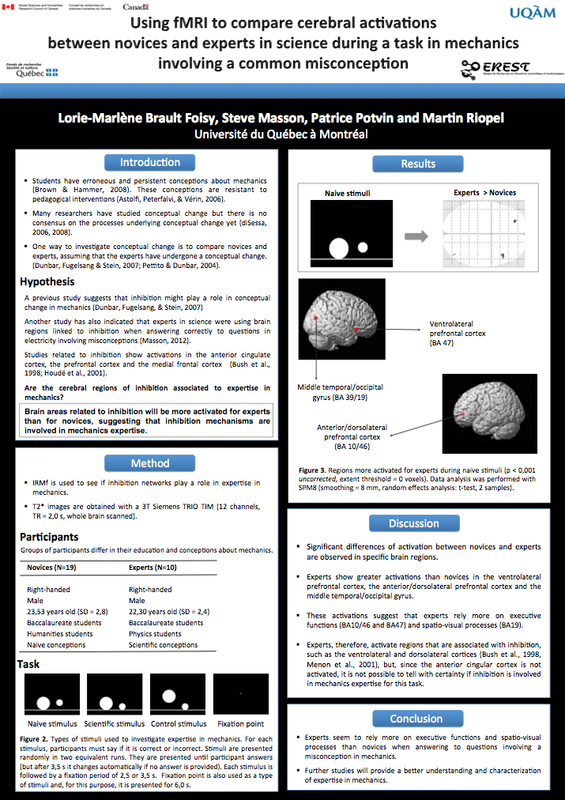 Paper presented at the Meeting of the Special Interest Group (SIG) 22 "Neuroscience and Education" of the European Association for Research on Learning and Instruction (EARLI), University of London, United Kingdom. In the process of teaching science, educational interventions are often challenged by students’ misconceptions about various natural phenomena. Those misconceptions are not only common, but they are also particularly difficult to eradicate, their persistence thus becoming a fundamental obstacle to science learning. Specifically, mechanics is an important field of physical sciences that has been shown to be one of the most difficult to learn for students. The main objective of this research was to determine whether the brain regions usually associated with inhibition (including the anterior cingulate cortex and the dorsolateral prefrontal cortex) play a role in the expertise in mechanics. Two groups of participants were compared: a group of novices who have not undergone a conceptual change in learning mechanics and a group of experts who are presumed to have already achieved a conceptual change. An fMRI protocol was used to obtain functional brain images while doing a cognitive task in mechanics. Two types of movies were presented: Newtonian movies, which were consistent with Newton's laws of motion and naive movies, which were not. Participants were asked to judge whether the movies were scientifically correct or incorrect. First results will be presented at this conference. Pour consulter l'affiche, cliquez ici.